The presence simulation feature enables you to give the impression of being home when you are not. For example if you are on holiday normally there are no lights on in the evening and curtains or blinds are left open. This is a clear sign for potential burglars to see that no one is at home. 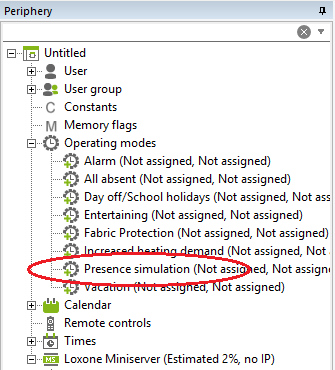 When you activate the presence simulation mode, you will enable the lights or music to turn on and off randomly during a predefined period of time. 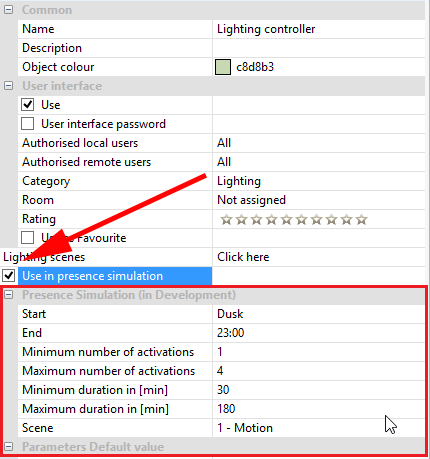 To enable the “presence simulation” mode on the lighting controller block, you first need to tick the checkbox : “use in presence simulation”. Once done, you can now define the time frame (beginning to end) of the simulation. Once activated it will turn on and off the lights a number of times determined randomly between the “Minimum number of activations” and the “Maximum number of activations”. In addition you can set the minimum and maximum time duration. Finally, you can decide which lighting mood will be started. If you set the parameter to 0, the mood will be chosen randomly. 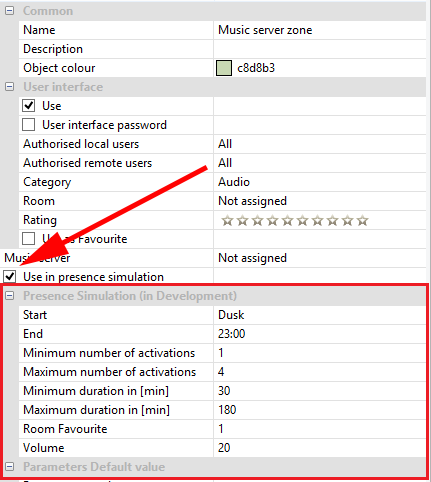 To enable the “presence simulation” mode on the Music Server Zone block, you first need to tick the checkbox : “use in presence simulation”. Once done, you can now define the time period (beginning to end) during which the mode will run. Once activated it will turn on and off the music a number of times determined randomly between the “Minimum number of activations” and the “Maximum number of activations”. Finally, you can choose your favourite room to start playing the music. You can also setup the volume. Presence simulation is automatically added as a default operating mode in the Periphery tree underneath the Operating modes section, and can be activated by turning it on and off as with any other other operating mode. The different function modes are automatically integrated in the Loxone program. You just need to activate them through an action. Once activated, the presence simulation will automatically turn on and off the lights or music in the rooms you have previously set up.